Kim Scott is a Family Nurse Practitioner, Board Certified as an Asthma Educator and an Otorhinolaryngology Nurse. Kim worked as an FNP for an ENT/Allergy/Sinus specialist in Fresno, California before joining Eastern Virginia Ear, Nose & Throat Specialists (EVENTS) October 2008. 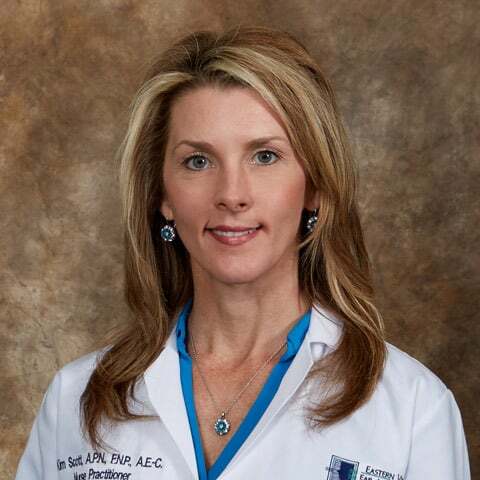 She received her Bachelor’s of Nursing Degree at Virginia Commonwealth University, Medical College of Virginia in 2001 and her Master’s Degree as an FNP at the Medical University of South Carolina in 2003. Before becoming an FNP, Kim was a Registered Nurse working in a Cardiovascular Intensive Care Unit. Kim authored, “Quick Reference Guide for Otolaryngology”, written especially for Nurse Practitioners and Physician Assistants. The book was co-authored by Dr. Richard Debo, Dr. Alan Keyes and Dr. David Leonard who also work at EVENTS. Kim is also an Otolaryngology expert on the board panel for the National American Nurses Credentialing Center. Kim serves our patients in our Virginia Beach and Chesapeake offices.